What’s the best way to set up a kitchen? If you’ve been cooking for any length of time, you’ve either figured this out for yourself, in your own kitchen — or you are still looking for that magic solution. This diagram might not be how your kitchen actually looks, but the way it divides up the space is useful information for any kitchen. If you’ve ever planned out a kitchen, or even just read enough kitchen remodeling blogs, you’ve no doubt heard of the kitchen work triangle (the idea that in an ideal kitchen, the line drawn between the refrigerator, range, and sink creates a triangle within which the cook can easily and efficiently move about). But some say it’s more useful nowadays, given the variety of kitchen sizes and arrangements, to think not in terms of a triangle, but in terms of 5 work zones. 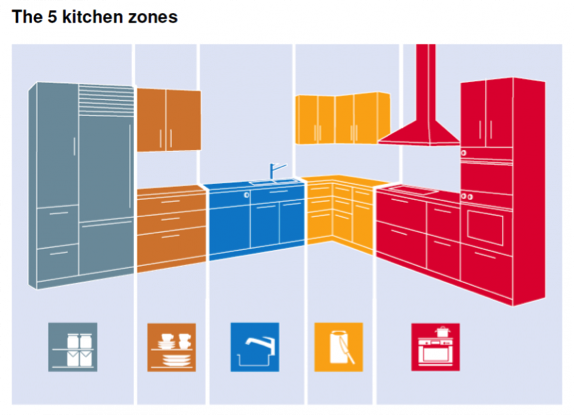 Most kitchens can be divided up into these work zones. Even if you have a tiny galley kitchen, you still probably have the essentials: a fridge (consumables zone), some cabinets (non-consumables zone), a sink (cleaning zone), a little countertop space (preparation zone), and a stove (cooking zone). These work stations should be organized in a layout that decreases the time spent traveling in between zones. Considering work zones is not only an efficient approach to design, but also matters for safety….for example having a prep zone near the cook zone allows you to move quickly with the hot dishes from the oven to the counter, making spills and burns less likely. When planned according to your lifestyle, a remodeled space should simplify your work in the kitchen. Even before your initial consultation with a contractor or designer, you can start mapping out which zones should be included in your personalized design. If you’re an avid baker, talk to your designer about adding a bake zone as part of your remodel. If you entertain often, it might be best to include a zone for guests to be near the chef without getting in his or her way. These are just two examples of how HMMH KB can customize your kitchen space for YOU. As families have evolved, so have our design principles. Good designers understand the importance of tailoring every space to a family’s or homeowner’s lifestyle, which mean they should ask how you plan to use your kitchen. This will guide their design as they organize your specific work zones. A designer’s knowledge, experience and creativity can help them guide you through the layout options available within your space and budget. At HMMH Kitchen & Bath our goal for all of our kitchen remodels is to have our homeowners drink their morning coffee or enjoy their night time glass of wine, kicked back and looking at their beautiful new space and thrilled with the end results. Our portfolio contains some of our custom kitchen remodels completed. Scroll through the pictures and call today, 847-713-2120, to schedule one of our Kitchen Remodeling Professionals to come and turn your kitchen into your REALITY DREAM KITCHEN.